A new biography about William Wedgwood Benn, the father of Tony Benn, will be officially launched at this special lecture by author, political historian and Visiting Lecturer at City, Dr Alun Wyburn-Powell. Dr Wyburn-Powell will discuss the myths surrounding the Benn family’s past, explain how William Wedgwood Benn became the “pivot” for the politics of his children and grandchildren and will explore the lessons the Labour Party can learn from history in its search for a new leader. 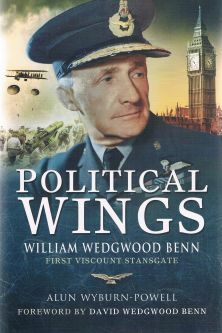 His book, Political Wings, provides the first comprehensive account of the life of William Wedgwood Benn, the challenges he faced while a cabinet minister and the origins of the country’s best known political dynasty. William Wedgwood Benn, the first Viscount Stansgate, was the first of three successive generations of his family to sit in Labour cabinets. Each was present during one of Britain’s major financial crises. The politician, who served in both world wars and defected from the Liberals to the Labour Party in 1927, was Secretary of State for India in Ramsay MacDonald’s Labour cabinet from 1929 to 1931. His son Tony Benn was in the cabinet during the IMF loan crisis in 1976 and Tony’s son, the current Shadow Foreign Secretary Hilary Benn, was in the cabinet during the 2008 to 2010 crash. Several members of the Benn family, together with journalists and historians, will be at the event and copies of Political Wings will be available to buy (cash or cheque only). The lecture and discussion will be followed by a small reception to which all are welcome.